Parodic humour was integral to Dada, and the influence of Nietzsche on dada is well known. However, the connections between buffoonery, Nietzsche and the anti-sublime in Dada have remained under-explored. This paper links key Dadaists in Berlin and Zürich to Nietzsche’s Ecce Homo, and to the Hanswurst – a tradition of German buffoonery – which Nietzsche deploys to counter the Schopenhauerian sublime. Hugo Ball is sometimes described as the ‘father’ of Dada. But Ball knew his Nietzsche well. Not only had Ball – a German national who left Berlin for neutral Switzerland in 1915 – written an unpublished doctoral dissertation on Nietzsche,6 he also refers to him extensively both in his Critique of the German Intelligentsia (1919)7 and also in his Flight out of Time: A Dada Diary.8 There he claims that Nietzsche ‘sang the praises of foolishness [Torheit]’ whereas Schopenhauer sang the praises of ‘cleverness [Gescheitheit]’.9 Since in his Critique he discusses both Schopenhauer and Nietzsche’s Ecce Homo in some detail, we might speculate that some of the background that I am sketching in here would have been familiar to Ball.10 If so, it might help explain Ball’s (temporary) adoption of the role of the fool; his joining of an itinerant vaudeville group; and the eventual foundation of Cabaret Voltaire in Zürich in 1916: the event that is generally picked out as the origins of Dada as a movement. In Ecce Homo Nietzsche asserts: ‘I have a terrible fear that one day I will be pronounced holy: you will guess why I publish this book beforehand; it should prevent people from doing mischief with me. – I do not want to be a holy man, sooner rather a Hanswurst. – Perhaps I am a Hanswurst. –.’11 Hanswurst (sometimes also Hans Wurst) translates literally as ‘Hans the Sausage’: it is conventionally translated as either ‘buffoon’ or ‘clown’. Hanswurst was a crude, burlesque-style rascal in a tradition of German-language semi-improvised comedy in which obscenity was both celebrated and valued. Ecce Homo – the book in which Nietzsche expresses his Hanswurst ambitions – is a half humorous and half megalomaniac autobiography, with chapter titles such as ‘Why I am So Wise’, ‘Why I Write such Good Books’ and ‘Why I am So Clever’. From the start, Nietzsche’s tone alerts us to the fact that we should not take his words at face value – as we certainly should not, given the falsehoods and crazy exaggerations that the text includes. Written in 1888, Ecce Homo was not published until 1908: eight years after Nietzsche’s death, and nearly twenty years after Nietzsche’s catastrophic nervous breakdown in January 1889 which left him completely incapacitated. During the intervening years Nietzsche’s sister, Elisabeth Förster-Nietzsche, edited the text (and the rest of his œuvre) in such a way as to portray her brother as favourable to German nationalism – redacting those passages in which Nietzsche’s criticisms of Germany (and of her) were at their most extreme.15 Despite Elizabeth’s success in promoting a Nietzsche cult and aligning it with anti-Semitism, Ecce Homo is a clear influence on the exiles from German militarism who were linked to Dada in Zürich, and also on the Dadaist critics of German culture and nationalism in Berlin. Ball comments extensively on Ecce Homo, and we know that Hausmann himself owned a copy, along with three other books by Nietzsche.16 A 1922 photomontage by his partner, Hannah Höch, includes a direct quotation from Nietzsche’s Ecce Homo among her ‘proverbs’. Placed next to a (partly obscured) photograph of herself in the photomontage Meine Haussprüche (My Household Proverbs) 1922, the passage translates as: ‘acoustic illusion that where nothing is heard, also nothing is there’.17 Art historian Michael White has argued that Johannes Baader’s exhibit at the first International Dada Fair in Berlin in 1920, Great Plasto-Dio-Dada-Drama, reworks the genre of fantastical autobiography in a way that is indebted to Nietzsche’s Ecce Homo.18 The structure of the five tiers and pinnacle of Baader’s elaborate installation – which was constructed out of a mélange of found objects and printed posters, newspapers and papers – was explicitly linked by Baader in the accompanying text to his fictional autobiography, The Fantastic Life Story of the Oberdada. 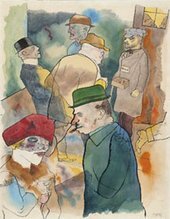 Even more obviously (although generally missed by art historians and commentators), George Grosz is drawing on Nietzsche when he gives the title Ecce Homo to a portfolio of eighty-four drawings and sixteen watercolours that he produced between 1915 and 1924. The ultimate derivation of Grosz’s title – which translates into English as ‘Behold the Man’ – is the Latin phrase used by Pontius Pilate (John 19:5) when he presents Christ, scourged and crowned with thorns to a hostile crowd shortly before his Crucifixion. But, more immediately, it refers back to Nietzsche’s autobiography in which he positions himself as a Hanswurst and a counter to the wounded Christ. The final watercolour in Grosz’s original – initially banned, but later reissued – book based on Ecce Homo is entitled Dämmerung (Twilight): a title that itself recalls the title of another of Nietzsche’s late works, Götzen-Dämmerung (Twilight of the Idols) 1889 (fig.2). Nietzsche’s title is itself a satirical play on the title of Wagner’s opera, Götterdämmerung (Twilight of the Gods), and – like the late Nietzsche – Grosz was evidently opposed to the German nationalism of Wagner and the Wagnerians, as is evidenced by Drawing 16 of his Ecce Homo book. ‘In Memory of Richard Wagner’ depicts a paunchy, middle-aged, male who is attired in Teutonic costume from the waist up, with cow horns on his head and a spear in his left hand and a cigar in his right, but with bare buttocks. The cigar (marked with an imperial cross, symbolising German militarism) points suggestively towards a completely naked and overweight female, of Wagnerian type and stature, and an equally naked and sexually immature girl. Grosz’s contempt for Wagner, and the symbolism of Teutonic militarism as deployed by the Wagnerians, is hard to miss. It is unclear whether Grosz was an objective ‘natural scientist’ simply recording these events, as he claims in his Autobiography, or whether – as he then goes on immediately to assert – he identified with all the characters that he lampooned.21 In any case, the Ecce Homo portfolio triggered an obscenity trial in 1923–4, and it is not hard to see why. Grosz explains how he simply ‘played along with’ the persona of the ‘talented loafer’, ‘circus clown’ and ‘sidewalk artist’, and he suggests that all these roles were integral to Dada, although he also remarks, ‘I was and still sometimes am something of all the above’.22 What this has to do with Nietzsche and the sublime, I shall now attempt to describe. As well as proclaiming himself as a Hanswurst in Ecce Homo, Nietzsche describes Shakespeare’s Hamlet in similar terms: ‘I know no more heart-rending reading than Shakespeare: what must a man have suffered to have such a need of being a Hanswurst! – Is Hamlet understood? Not doubt, but certainty, is what makes one insane. – But to feel that way, one must be profound, an abyss, a philosopher. – We’re all afraid of the truth’.23 This extremely odd link between Shakespeare, Hamlet and being a Hanswurst needs to be understood in terms of the account of the sublime to be found in the philosopher who most influenced Nietzsche as a young man: Arthur Schopenhauer. Schopenhauer has substituted the Hindu trope of ‘Veil of Maya’ from the Upanishads for the apparently Egyptian – but, in fact, Greco-Roman – trope of the ‘veil of Isis’ which Kant, Schiller, Reinhold, Novalis and Mozart had all associated with the sublime.27 As Kant himself put it: ‘Perhaps nothing more sublime has ever been said, or thought ever been expressed more sublimely, than in the inscription above the Temple of Isis (Mother Nature): “I am all that is and that was and that shall be, and no mortal has lifted my veil.”’28 Schopenhauer – like Schiller, Novalis and Reinhold (but unlike Kant) – believed that it was possible to gain contact with this suprasensible ‘truth’ via the experience of the sublime. Schopenhauer suggested that tragedy induces a kind ascetic saintliness: ‘the summons to turn away the will from life remains the true tendency of tragedy’.29 Schopenhauer also insisted that modern tragedy – especially Shakespearean tragedy – is far superior to that of the Greeks.30 This is, he says, because it is the function of tragedy to produce compassion or pity [ Mitleid], and to act as a ‘quieter’ of the individual’s own will.31 The best tragedy will produce ‘resignation, the giving up not merely of life, but of the whole will-to-live itself’.32 For Schopenhauer, this will-negating response to tragedy occurs when one’s own individualised will is made to seem pointless and, as such, is disabled, leading the spectator (or tragic hero) to turn his or her back on life. Schopenhauer illustrates this ascetic resignation through the example of Hamlet’s ‘to be or not to be’ monologue. His claim is that Hamlet illustrates that life ‘is so wretched that complete non-existence would be decidedly preferable to it’. It shows that, faced with the choice of living or not living, no ‘sincere’ man who is still ‘in possession of his faculties’ could, at the end of his life, ‘ever wish to go through it again. Rather than this, he will much prefer to choose complete non-existence.’33 For Schopenhauer, the superiority of Hamlet over any Greek hero is proved precisely by the fact that Hamlet’s failure to act – or even will his own suicide – displays a pessimism which is at odds with Greek ‘optimism’, and the latter is dismissed as ‘not merely an absurd, but also a really wicked way of thinking’.34 For Schopenhauer, Shakespeare is supremely sublime because he sees into the ‘horror’ of existence, and leads the audience towards despair. Hamlet: What should a man do but be merry? For look you how cheerfully my mother looks, and my father died within’s two hours. Ophelia: Nay, ‘tis twice two months, my Lord. Importantly, for Schopenhauer, Hamlet’s ‘humour’ does not conflict with the utterly sublime ‘moral’ that he elsewhere claims to find in Shakespeare’s play. Indeed, the first ‘joke’ shows Hamlet repeatedly willing his own death – but without actually committing suicide – in a way that neatly illustrates Schopenhauer’s belief that Hamlet makes us register that no man can will to live his life more than once. Schopenhauer’s second example also seems to show that deep seriousness (death and murder) can be appropriately expressed through merriment, playfulness and an outward display of cheerfulness. For Schopenhauer, however, a Hanswurst is incapable of real humour and is, by implication, also estranged from the sublime. Schopenhauer’s contrast between the ‘German’ and ‘English’ comic traditions gains resonance from earlier Enlightenment attempts to ban the Hanswurst – and all improvisation, slapstick and gross humour – from the German stage, and to replace this low ‘German’ and Austrian kind of humour with translations from more ‘refined’ English, French and Italian tragedies and dramas, and with no deviation from the written scripts. The banishment of Hanswurst was symbolically staged in 1737 by Caroline Neuber who wrote a special prologue, entitled ‘The Victory of Reason or the Death of Hanswurst’, for her acting troupe, to back up the theories of Johann Christoph Gottsched who was concerned to eject the ‘disorderly’ figures of Hanswurst and Harlequin from the stages of German-speaking theatres.42 Hanswurst was solemnly burnt in effigy; but Gottsched himself was himself a Francophile, and initiated a debate that resonated through the eighteenth century as to whether Racine or Shakespeare should provide a more adequate model for the German stage.43 In Vienna, meanwhile, the Hanswurst found defenders in the so called Hanswurststreit (Hanswurst controversy) which lasted between 1747–69; and even in the North the ban on extemporised performances involving Hanswurst-type figures was never fully implemented. Schopenhauer’s contrast between the ‘German’ comic tradition – allied to the Hanswurst – and to a more elevated and profound ‘English’ kind of humour clearly incorporates some elements of the reforming zeal that was initiated by Gottsched’s and Neuber’s attempts to create a new and ‘moral’ theatre for German-speaking peoples. However, since Schopenhauer’s chapter on the ‘ludicrous’ also itself cites the attempt to ban improvisatory drama as giving rise to an example of the ludicrous – when a horse ‘dunged’ on the Berlin stage, despite the ban on improvisation – it is clear that he is not straightforwardly writing in opposition to the Hanswurst.44 It is just that he is insisting that the Hanswurst – the merely ‘comic’ – cannot also be sublime. The feelings of horror and of nausea engendered by Dionysian knowledge are ‘discharged’ through comedy and ‘healed’ by sublime tragedy. Thus, the underlying message of The Birth of Tragedy is optimistic. This is also borne out by an even more striking difference between the two philosophers’ accounts of the tragic: namely, that Nietzsche portrays Greek tragedy as greatly superior to that of the moderns. Indeed, Nietzsche values precisely that Greek cheerfulness that Schopenhauer had dismissed as both senseless and ‘wicked’. Hamlet is given Schopenhauerian significance by Nietzsche, but the Schopenhauerian framework of values is also implicitly undercut. In his late writings Nietzsche moved further and further away from Schopenhauer, and he criticises ‘those who are sublime’ for their inability to laugh. Thus, in Thus Spoke Zarathustra (1883–5), Zarathustra complains that the man who is sublime is disfigured by disgust: ‘Contempt is still in his eyes and nausea hides round his mouth’.48 Earlier, as a young man, Nietzsche had modified Schopenhauer as he found a way to think the sublime as ‘taming’ – or, more literally, ‘binding’ – the ‘horror’ of existence, and opening up the possibility of willing to live one’s life over again. But now Nietzsche finds a different response to Schopenhauer, as Zarathustra discovers a different way of rationally willing the recurrence of one’s life – however terrible and tragic that life might be. He insists that the greatest human being (the ‘overman’) is able to say ‘yes’ to life, and will that the world should repeat itself in all details an infinite number of times again – however awful that thought (and the suffering) might be.49 This is the climax of the third book of Thus Spoke Zarathustra (Part 3); and in the final book (Part 4) Nietzsche affirms a kind of ecstatic buffoonery as Zarathustra embraces this most terrible thought. In his so-called ‘late’ period, Nietzsche denies that there is any underlying or sublime ‘truth’ that is covered over – and healed – by art. Instead, we are left with a play of surfaces, and with the affirmation of life as the new ideal. Indeed, in Ecce Homo Nietzsche takes an additional step as he aligns himself with the Hanswurst: with a mode of the ridiculous, the crude and the all-too-human – with that which is, above all, not elevated, self-denying or sublime in the Schopenhauerian sense. Thus, in the section of Ecce Homo in which Nietzsche links Shakespeare’s Hamlet to the Hanswurst, he goes on to claim that it was Francis Bacon, not Shakespeare, who wrote this play. And Nietzsche not only praises Bacon for being ‘the first realist in every great sense of that word’, he also praises the ‘strength’ that Bacon possessed ‘for action, for monstrous action, for crime’.50 In adopting the persona of a Hanswurst in Ecce Homo, Nietzsche is aligning himself not only with a mode of the ridiculous that is cut off from the sublime, but also with that which is morally repellent – with ‘monstrous action and crime’. As far as the references to Galiani are concerned, I do not think Nietzsche was thinking primarily of Galiani’s (undoubtedly) lecherous character (as Kaufmann’s notes to Beyond Good and Evil seem to suggest),53 but to the fact that, like the Hanswurst, Galiani was above all concerned with the mechanisms of desire, money and of greed. He wrote wittily about value, and how it fluctuates in relation to appetites, need and scarcity. Nietzsche makes several references to his ‘friend’ Galiani in his late Notebooks. As in the equation of Shakespeare with Bacon in Ecce Homo, Nietzsche’s positive comments on Galiani as a Hanswurst suggest the need to search for truths not at the level of what is ‘deep’ or ‘objective’, but through a new kind of realism in which attention is paid to surfaces, to human motivation and lusts. Perhaps truth is a woman who has reasons for not letting us see her reasons? Perhaps her name is – to speak Greek – Baubo? It seems that in his late writings Nietzsche came to regard Galiani and all other Hanswürste as also superficial ‘out of profundity’. Truth is not veiled but naked; fleshiness and human baseness are affirmed as Nietzsche seeks to strip away any sense of pity or compassion, and block all conventional notions of the tragic. This is a dangerous endeavour, as Nietzsche also registers. Announcing the move from ‘Incipit tragoedia’ (‘Let the tragedy begin’) to ‘incipit parodia’ (‘Let the parody begin’) in this 1887 Preface to The Gay Science, Nietzsche’s voice also proclaims the arrival of ‘Something downright wicked and malicious’.56 It is the Hanswurst – and of Nietzsche himself as a ‘downright wicked and malicious’ Hanswurst – who enters and seeks to put an end to the ‘tragedy’ of life with these ominous and mocking words. We can now see the links between the sublime and the Nietzschean-inspired buffoonery of the Dadaists in Berlin. Their response to the chaos and tragedy that confronted them in war-ravaged and inflation-blighted Germany seems to echo Nietzsche’s announcement: ‘Let the parody begin’. Indeed, Nietzsche’s description of his ‘filthy’, yet ‘clear-sighted’, Hanswurst ‘friend’, Galiani, might also serve as a depiction of George Grosz – or at least of the way Grosz portrays himself in the Ecce Homo portfolio. Like the mythic clown Baubo, Grosz seems to delight in showing female nakedness, and laughing at the notion that there is a sublime ‘truth’ concealed behind the veil. Instead, skin, flesh and nakedness are celebrated in a laughter that seems designed to counter the sublime. Grosz seems to have taken the admonition to become ‘superficial out of profundity’ as his own ideal. There are superficial similarities between the absurdity of the costume that Ball adopted as he recited this ‘sound poem’ and that of the Hanswurst – even if the shiny blue surface substituted for the more traditional reds and greens of the Hanswurst attire. 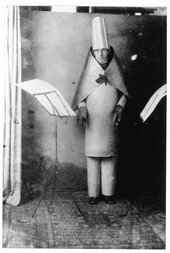 However, it would seem that, even during the foundational performances that announced Dada in Zürich, the underlying mood of Ball’s antics is closer to Schopenhauer – in which the self is completely surrendered, and all individuality falls away – than to the Hanswurst tradition that seems so closely aligned to the ‘dandyism’ of Dada in Berlin. Ball’s Dada Diaries of 1916 show him depicting himself as a kind of Schopenhauerian ‘magical bishop’ who surrenders all agency, consigning his body into the hands of others as he becomes simply a mouthpiece for a kind of universal lamentation. By contrast, the laughter and parody which emerged from the Dadaists who remained in Berlin during the war years seems far more Nietzschean. But if we listen more intently, we find ourselves detecting a kind of hybrid between Nietzschean buffoonery and the Schopenhauerian ridiculous. Grosz, in particular, aligns himself with the monstrous and the criminal, even as he subjects it to excoriating critique. Outwardly, he assumes the mask of the Nietzschean Hanswurst; but elements of Schopenhauerian pessimism and of the sublime still persist. If not exactly ascetic in the Schopenhauerian sense, the overwhelming mood of the laughter is nihilistic – closer to Schopenhauer’s humour that is both ‘ridiculous’ and ‘sublime’ than to the ‘Yes-saying’ and ecstatic buffoonery of Nietzsche’s late texts. 1. Raoul Hausmann, Am Anfang war Dada, Steinbach, Giessen 1972, p.16. I am grateful to Gwendolen Webster who emailed the editor of Tate Papers (10 June 2010) to point out that the more standard translation of the sentence ‘Was ist Euch Jesus Christus. Er ist Euch Wurst!’ is ‘What is Jesus Christ to you? You couldn’t care less about him!’, and I have accordingly made a correction to the original published text (revised September 2010). The standard translation does not, however, seem strong enough to explain why Hausmann thinks it appropriate to use this sentence as direct evidence for the death of God. I have therefore retained a non-idiomatic translation in an attempt to connote some of the bawdier uses of Wurst in the German language (including its links to the male sexual organ and to excrement) which are also at stake in the tradition of Hanswurst drama that is the focus of this article. In the email correspondence, Gwendolen Webster also argues that Johannes Baader’s heckle should be understood as opposing hypocrisy and, as such ‘had nothing to do with the Berlin Dadaists’ attitude to religion’. However, even if Baader did nurse religious fantasies, as Gwendolen Webster maintains, Hausmann himself clearly uses Baader’s intervention for anti-religious (and Nietzschean) ends when he remarks that we need to publicise the death of God and, in the very next sentence, quotes Baader’s interruptive shout to illustrate the point. The pronoun ‘Euch’ is the plural of ‘thou’ (so ‘thee all’), and Hausmann implicitly suggests that all of us – not only the preacher or the congregation in the Berlin Cathedral – have turned the Christian God into meaningless and valueless Wurst. 2. Nietzsche first puts forward this doctrine in The Gay Science (1882), §s108, 125; but it is Thus Spoke Zarathustra (1883–5) that is best known for popularising this thought. See Friedrich Nietzsche, The Gay Science [1882/7], trans. Walter Kaufmann, New York 1974, pp.167, 181–2 (KSA 3/467, 480–82), and also Zarathustra’s ‘Prologue’, §s 2, 3, Thus Spoke Zarathustra [1883–5], in The Portable Nietzsche, (ed. and trans.) 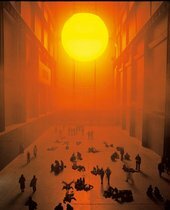 Walter Kaufmann, New York 1972, pp.124, 125 (KSA 4/14, 15). KSA refers to the volume and page number in the standard German edition: Friedrich Nietzsche, Sämmtliche Werke: Kritische Studienausgabe, eds. Mazzino Montinari and Giorgio Colli, Berlin, 15 vols., 1967–. The KSA pagination is provided for all references to works by Nietzsche, since translations and also texts are markedly different. 3. It seems to be generally accepted that the total number of military deaths during the 1914–18 war was around 8,500,000. The statistics for civilian casualties is harder to determine, varying between 6.6 and 9 million. See Mathew White, ‘Source List and Detailed Death Tolls for the Twentieth-Century Hemoclysm’. 4. See, for example, the chapter on ‘Tricksters, Carnival, and The Magical Figures of Dada Poetry’ in Richard Sheppard, Modernism–Dada–Postmodernism, Evanston 2000, pp.295–8. Sheppard links the Dada trickster to Bakhtin and Jung, ignoring the Nietzschean background that I explore here. 5. Sheppard does not discuss Hanswurst at all, instead linking the Dada trickster to the figures of ‘Kaspar’ and ‘Kasperl’. See ibid., pp.292–303. Kasperl is a kind of Austrian and German puppet, analogous to the British Mr. Punch. A diminutive, less obscene and much tamer version of Hanswurst, Kasperl is generally regarded as a later development of the Hanswurst tradition. See, for example, Karen Jürs-Munby, ‘Hanswurst and Herr Ich: Subjection and Abjection in Enlightenment Censorship of the Comic Figure’, New Theatre Quarterly, vol.23, no.2, 2007, pp.133–4. 6. Hugo Ball, ‘Nietzsche in Basel: Eine Streitschrift’, written 1909–10, is the introduction to the unpublished dissertation. 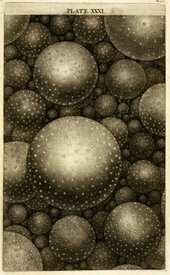 See Hugo Ball, Der Künstler und die Zeitkrankheit: Ausgewählte Schriften, ed. Hans Burkhard Schlichting, Frankfurt am Main 1988, pp.61–101. See also Debbie Lewer, ‘Hugo Ball, Iconoclasm and the Origins of Dada in Zurich’, Oxford Art Journal, vol.32, no.1, 2009, pp.17–35. 7. Hugo Ball, Critique of the German Intelligentsia , trans. Brian L. Harris, New York 1993. 8. See Hugo Ball, Flight Out of Time: A Dada Diary , ed. John Elderfield, trans. Ann Raimes, Berkeley, Los Angeles and London 1996. When referencing this work, dates of diary entries are given as well as page numbers. 9. Ibid., p.47 (20 November 1915). 10. Ibid., pp.21 (20 June 1915), 120 (18 June 1917), 156 (5 May 1918), for example. 11. §1 of ‘Why I am a Destiny’, Ecce Homo (KSA 6/365), own translation. See also Ecce Homo [1888/1908], trans. R. J. Hollingdale, Harmondsworth 1979, p.126. 12. Betsy Aikin-Sneath, Comedy in Germany in the First Half of the Eighteenth Century, Oxford 1936, p.46. 13. Mary Wortley Montague, The Letters and Works of Lady Mary Montague, 2nd (revised) ed., London 1837, 3 vols., vol.1, pp.284, 285. 15. It is only the most recent editions of Ecce Homo which have restored the passages that Nietzsche’s sister suppressed. Compare, for example, §3 of ‘Why I am so Wise’ (KSA 6/267–9) in the revised and abridged version of Hollingdale’s translation of the Ecce Homo text in The Nietzsche Reader, eds. Keith Ansell Pearson and Duncan Large, Oxford 2006, pp.504–5, with the same section in the original translation by Hollingdale, 1979, pp.41–2. 16. See Michael White, ‘Johannes Baader’s Plasto-Dio-Dada-Drama: The Mysticism of the Mass Media’, Modernism/Modernity, vol.8, no.4, 2001, pp.583–602, fn.29. White gives as his source Hanne Bergius who notes that Hausmann also possessed copies of Thus Spoke Zarathustra, Twilight of the Idols and The Gay Science. See Bergius, ‘Architecture as the Dionysian–Apollonian Process of Dada’, in Alexandre Kosuth and Irving Wolrath (eds. ), Nietzsche and An Architecture of our Minds, Los Angeles 1999, p.115. 17. The passage is taken from Friedrich Nietzsche, Ecce Homo, ‘Why I Write such Good Books’ §1 (KSA 6/300). See Ecce Homo, trans. Hollingdale, 1979, p.70. The citing of Nietzsche by Höch – and, indeed, the siting of the ‘proverb’ next to her own photograph – is ironic and also poignant. Echoing Nietzsche’s own compilations of pithy, newly invented proverbs (Sprüche), it evidently expresses Höch’s feeling that because Hausmann does not hear her voice, she has simply disappeared as a person and artist. Höch’s Meine Hausspruche (Berlinische Galerie, Landesmuseum für Moderne Kunst, Fotografie und Architektur) is reproduced in Ruth Hemus, Dada’s Women, New Haven and London 2009, p.121. 19. George Grosz, An Autobiography [1946/1955], trans. Nora Hodges, Berkeley and London 1998, p.119. 23. §4 of ‘Why I am so Clever’, Ecce Homo (KSA 6/287), own translation; see Ecce Homo, trans. Hollingdale, 1979, p.59. 24. Arthur Schopenhauer, The World as Will and Representation [1819/59], trans. E. F. J. Payne, New York 1966, 2 vols., vol.2, p.433, and see vol.1, pp.252–3. 26. Ibid., vol.1, pp.205–6 fn., corrected. 27. See Christine Battersby, The Sublime, Terror and Human Difference, London and New York 2007, chs.5 and 8 for a detailed argument of this point. 28. Immanuel Kant, Critique of Judgment, trans. Werner S. Pluhar, Indianapolis 1987, §49, p.185 fn. 29. Schopenhauer, World, 1819/59, vol.2, p.435. 31. Ibid., vol.1, p.253, and see pp.376–7 and vol.2, p.435. 37. Ibid., vol.2, p.101; see also Arthur Schopenhauer, Sämmtliche Werke, ed. Julius Frauenstädt, 2nd. ed., Leipzig 1908, vol.3, pp.111, 112. 38. Schopenhauer, World, 1819/59, vol.2, ch.8, p.101, corrected; Schopenhauer, Sämmtliche, 1908, vol.3, pp.111, 112. 39. Schopenhauer, World,1819/59, vol.2, p.101, corrected; Schopenhauer, Sämmtliche, 1908, vol.3, p.112. 40. William Shakespeare, Hamlet, ed. Willard Farnham, Baltimore 1974, Act II, scene ii, lines 214–5, p.74. Schopenhauer, World,1819/59, vol.2, p.100; Schopenhauer, Sämmtliche, 1908, vol.3, p.110. 41. Shakespeare, Hamlet, Act III, scene ii, lines 119–24, pp.97–8. Schopenhauer, World, 1819/59, vol.2, p.100; Schopenhauer, Sämmtliche, 1908, vol.3, p.110. 42. See Glynne Wyckham, A History of the Theatre, Oxford 1985, p.177; Karen Jürs-Munby, 2007, pp.124–5. 43. Margaret Herzfeld-Sander, Essays on German Theater, New York 2002, p.xi. 44. Schopenhauer, World, 1819/59, vol.2, p.93. 45. Friedrich Nietzsche, The Birth of Tragedy [1872/88], in Basic Writings of Nietzsche, ed. and trans. Walter Kaufmann, New York 2000, §7, p.60 (KSA 1/56–7). 46. Ibid., §7, p.60 (KSA 1/57). 47. Ibid., §7, p.60 (KSA 1/57). 48. Friedrich Nietzsche, Zarathustra, 1883–5, Pt.2, ‘On those Who are Sublime’ (‘Von den Erhabenen’), pp.228–31 (KSA 4/150–2). 49. See, in particular, ibid., Pt.3, ‘The Convalescent’, pp.327–33 (KSA 4/270–7). 50. §4 of ‘Why I am so Clever’, Ecce Homo (KSA 6/287), own translation; Ecce Homo, trans. Hollingdale, 1979, p.59. 52. Friedrich Nietzsche, Beyond Good and Evil , ed. and trans. Walter Kaufmann, New York 1966, §26, p.38 (KSA 5/44–5). 54. Nietzsche, Gay Science, 1882/87, Preface §4 to the 2nd ed. of The Gay Science (1887), p.38 (KSA 4/352). 55. See Battersby, 2007, pp.179, 182 for a further elaboration of this point. 57. KSA 14/232. For the background to the Isis myth in German Romanticism see Battersby, 2007, pp.88–99. 58. Nietzsche, Gay Science, 1882/87, Preface §4 to the 2nd ed., p.37, corrected (KSA 4/351). 59. Nietzsche, Zarathustra, 1883–5, Pt.4, ‘The Awakening’, pp.424–5, corrected (KSA 4/388–9). 60. Hugo Ball, Zur Kritik der deutschen Intelligenz, Bern 1919, pp.227–8. 61. Ibid., ch.4, see e.g. pp.319–22. 62. See Lewer, 2009, p.29, who credits for this point Philip Mann, Hugo Ball: An Intellectual Biography, London 1987. 63. See, for example, Ball’s final footnotes on Schopenhauer and Nietzsche, Zur Kritik, 1919, pp.319–22. Ball’s criticism of the late Nietzsche needs to be understood, in part, as a response to the fact that what he was reading was Nietzsche’s works as edited by Elisabeth Förster-Nietzsche, and as favourable to Prussian militarism. Against this Nietzsche, Ball turns towards Catholic mysticism and, more specifically, towards Thomas Müntzer, the 16th-century Reformation theologian and ‘plebeian revolutionary’. See Lewer, 2009. For Müntzer see also Niklaus Largier, ‘Mysticism, Modernity and the Invention of Aesthetic Experience’, Representations, no.105, 2009, pp.37–60. 64. Ball, Flight, 1927, pp.105–6 (23 June 1916). This is a shortened version of the account; see also Lewer, 2009, p.29. 65. Ball, Flight, 1927, p.23 (25 November 1914); and see Lewer, 2009, p.22. 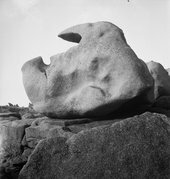 I am particularly grateful to Philip Shaw for the opportunity to test out my ideas; to Lydia Hamlett for assistance; and to others who provide administrative and technical support to Tate Britain’s AHRC-funded research project on The Sublime Object: Nature, Art and Language. This paper also incorporates some material from an earlier talk: ‘“Let the Devil wear Black”: Fate, Affirmation and the Laughter of Hamlet in Nietzsche and Schopenhauer’, Nietzsche Workshop, University of Warwick, 5 June 2008. I am indebted to Keith Ansell Pearson, the Workshop organiser, for feedback, as well as to other Workshop participants. An abbreviated version of this paper was presented at the Symposium ‘Wrong from the Start’: Modernism and the Sublime held at Tate Britain, on 30 November 2009. Other papers relating to the project can be found in Tate Papers no.13. This Paper was slightly revised in September 2010, following correspondence with a reader. See particularly endnote #1. Christine Battersby is Reader Emerita in Philosophy and Associate Fellow of the Centre for Philosophy, Literature and the Arts, University of Warwick. Christine Battersby, ‘‘Behold the Buffoon’: Dada, Nietzsche’s Ecce Homo and the Sublime’, in Tate Papers, no.13, Spring 2010, https://www.tate.org.uk/research/publications/tate-papers/13/behold-the-buffoon-dada-nietzsche-ecce-homo-and-the-sublime, accessed 24 April 2019.